Welcome to Frost Building Maintenance, Inc. Frost Building Maintenance, Inc. provides a wide range of exterior restoration services, including: tuckpointing, brick, stone, and concrete repairs. Caulking, painting, carpentry, exterior cleaning and above grade waterproofing are all standard services as the Project photos show. Areas that are high and difficult to reach are our specialty. Our projects vary in size, with prices ranging from $5,000 to over $1,000,000. Originally trained as a steeplejack, painting and repairing steeples and towers in the Cleveland area, company president John G. (Greg) Frost has over twenty-five years of experience in building repair and restoration. Mr. Frost graduated from the Columbus College of Art & Design in 1984 with a bachelor's degree in fine art. 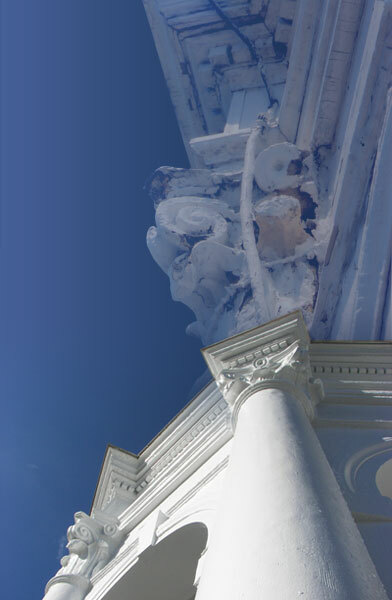 This unique combination of artistic training and building restoration skills has resulted in many successful restoration projects and satisfied clients. Approximately 85% of our workload is from referral and repeat customers. "...over twenty-five years of experience in building repair and restoration." Incorporated in 1994, Frost Building Maintenance, Inc. is located in Cleveland, Ohio. We are a primary contractor and do not subcontract our standard services. As a non-union company, our craftsmen are involved in all aspects of the repair and restoration process to maintain the highest level of quality and customer satisfaction. Frost Building Maintenance, Inc. employs climbers and riggers certified by the Scaffold Industry Association and has employees certified for the installation of Jahn Restoration Mortars and Edison Coatings restoration products. We are a member of The Greater Cleveland Better Business Bureau, The Cleveland Restoration Society, The Association for Preservation Technology International and The Scaffold Industry Association.